Music fanatics absolutely understand the importance of clear audio in headphones or speakers. And same by the creators of music or video for different purposes. As being a content creator, I know how much important is it to send a message or idea to the audience in an immaculate way. That is a reason most of the video or audio content creators keep searching to find out the best possible way to record their voices. Today’s epoch is where the quality recording of audio is not limited just to studios; now every YouTuber, Hobby to Pro singer, Podcaster, Gamer, Twitch user, Mixer or other live streaming users, all want a portable, low price mic but with rich and clear audio capturing capabilities. 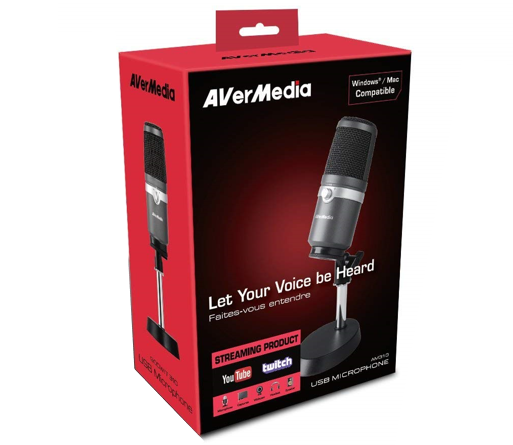 So, today in this review, we will analyze the AverMedia Am310 USB microphone. 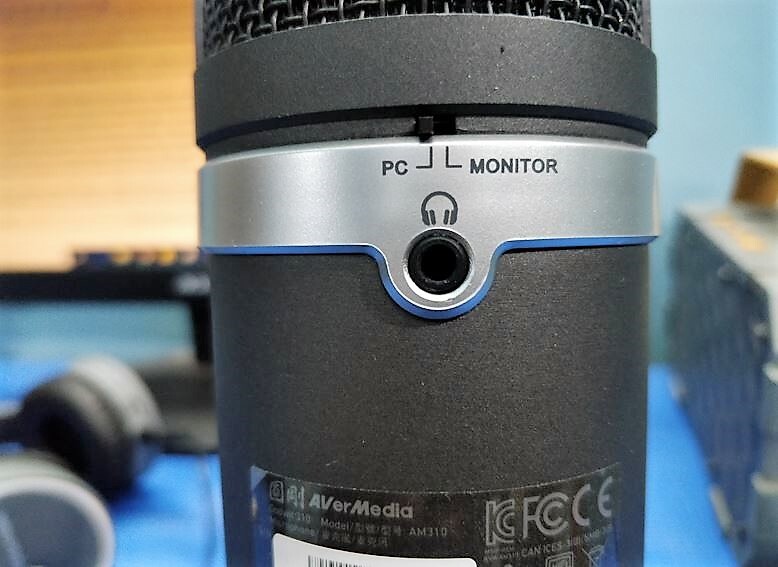 To procure the best technology for gamers and other audio or video content lovers, the Avermedia keeps expanding its product range and Am130 USB microphone is one of them. 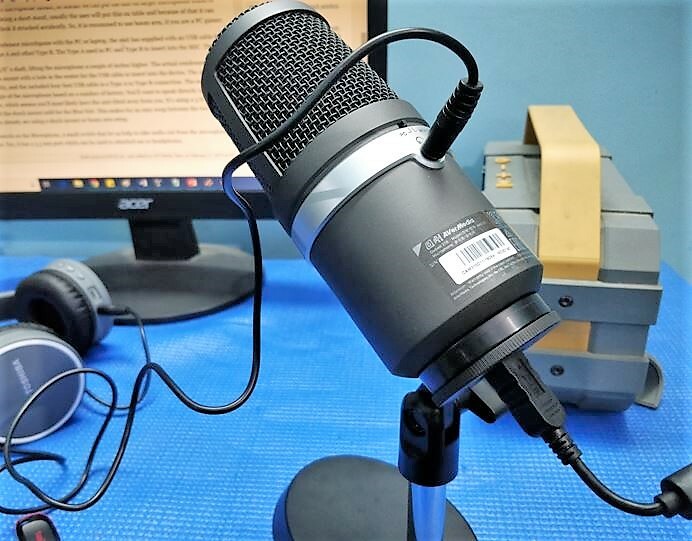 As we know after the popularity of games like PUBG and their live streaming along with a commentary while playing has increased the demand of prosumer microphones. 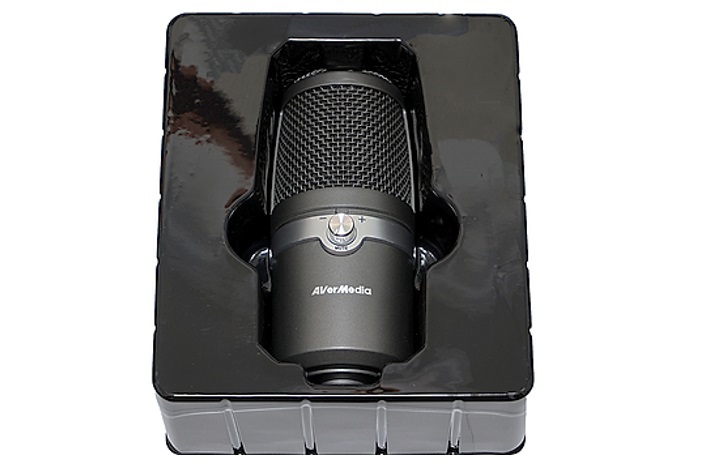 So, just to hit this sweet spot between professionals and consumers, the Avermedia has launched the Am310 which is USB 2.0 microphone meant for the podcast and to produce gaming content on YouTube, Twitch, or Mixer. The Avermedia Am310 is not fancy stuff but composed with the things those really needed in a microphone and that’s why the price of the AM310 is in the budget… It is a compact USB and stylish microphone. The first feeling for Am310 Red and Black box packaging is very great and adds gravity to its branding too. The appearance of the microphone is clearly displayed on the box along with the stand. As you open the box, the Am310 microphone main module in a plastic case with a groove for easy access will appear. Design wise the microphone crafted in a well-balanced way from top to bottom. 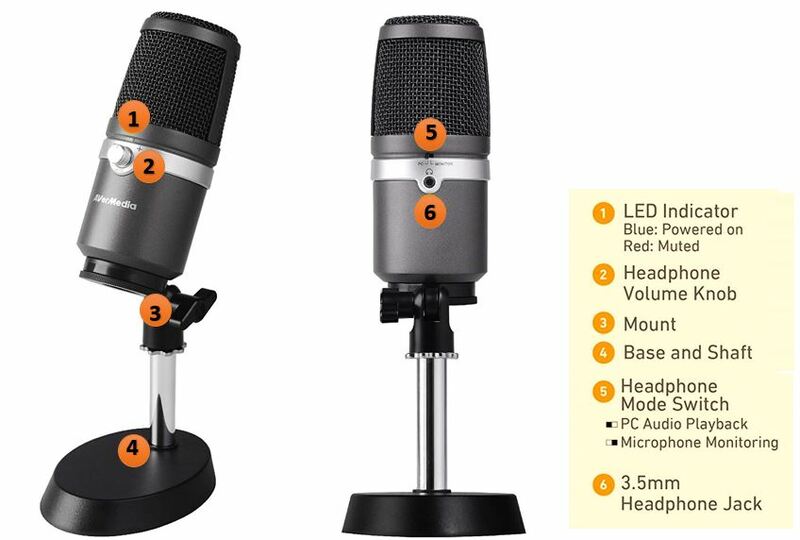 All the parts of the mic come detached or unconnected and the user needs to set all of them together for using the mic. The setup of the AM310 is very simple. The base of the AVerMedia Am310 uses big feet to prevent slippage. 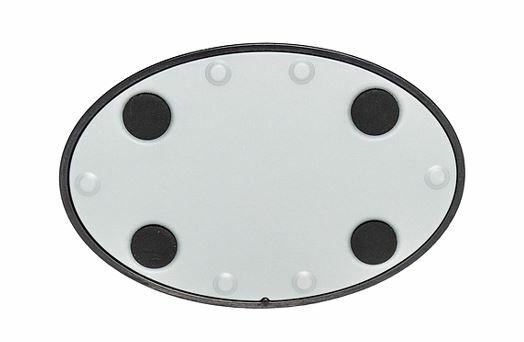 The elliptical design of the base prevents the Mic from any kind of lurch movements while using. Under the base, the rubber pads are given for firm placement over some smooth place like a polished desk. Size of this metal base is 3.5 x 5.0 x 0.75 inches. Am310’s base is connected with a shiny metal shaft which further attached to the U-shaped plastic clump with a metal female screw rings. Over this setup, the main module of the Am310 which is the USB microphone sits around 5 inches off the ground. The supplied stand is good and stable. 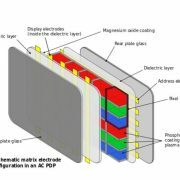 However, the plastic clamp is a bit flimsy as compared to the whole structure from base to mic module which is of metal. Nevertheless, having a standard microphone mount, we can put Am310 mic on a larger microphone stand or boom arm, if one required. Being a short stand, usually the user will put this on the table and because of that, it can easily transfer the sound of the desk if struck accidentally. So, it is recommended to use a boom arm, if you are a PC gamer. The mount also allows the user to change the angle of the microphone which is really useful. Means while recording vocals one can adjust the direction of the mic towards the audio source for optimal recording. To attach the AM310 condenser microphone with the PC or laptop, the unit has been supplied with a USB cable of 4 feet long, whose one end is Type A and the other Type B. The Type A used in PC and Type B for inserting into the MIC. There are two controllers on Am310, one is the volume Knob and other is a toggle switch. This small toggle switch let us help to take audio out from the microphone or PC to headphone. Yes, as you can see in the below picture, the mic has a 3.5 mm port which can be used to attach earphones or headphones. Once we insert the headphone jack into the mic’s 3.5mm female port, we can use a toggle button to hear the audio from the PC or to monitor microphone’s capturing in real-time to hear the audio while recording for different purposes such as gameplay, music, or live stream. On the opposite side of the toggle button, there is a volume Knob. It is meant to contain the sound output to headphones. Plus pressing the same knob controller inwards, will mute the microphone and pushing it again the same will unmute. Here are the steps to record sound with AM310. First setup the Am310 mic. 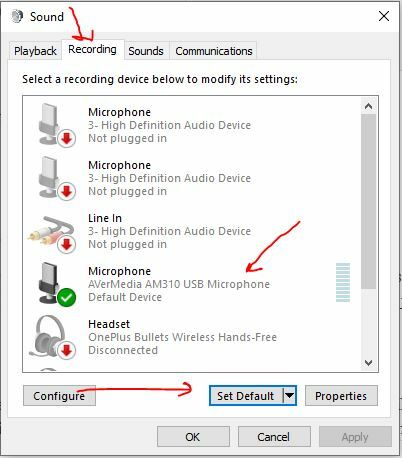 Connect the USB cable one to Mic and other to PC. Now from your Windows system click on the Start menu and search for Control Panel. As it appears, open it. Click on the Hardware and Sound option. 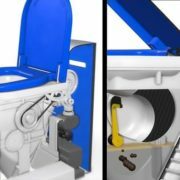 Under the Hardware and sound you will find one more option: Sound, click to open that. Click on the Recordings tab, find the Avermedia Am310 and set it as default. 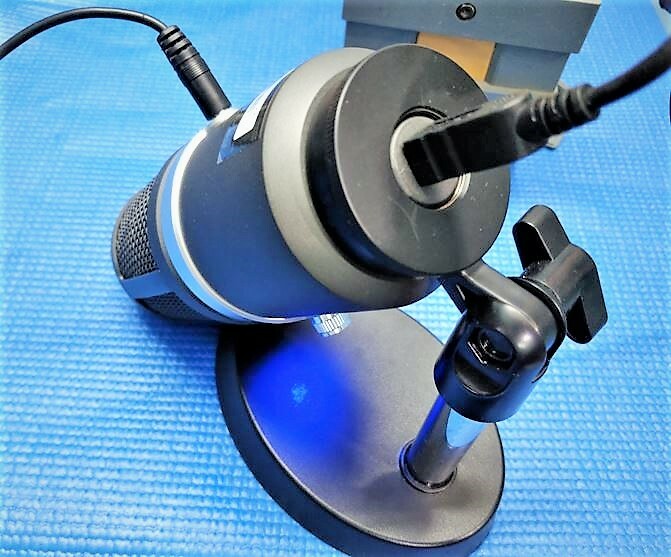 It is a unidirectional mic, which means it picks sound with high gain from surroundings coming from a specific side or direction of the microphone. 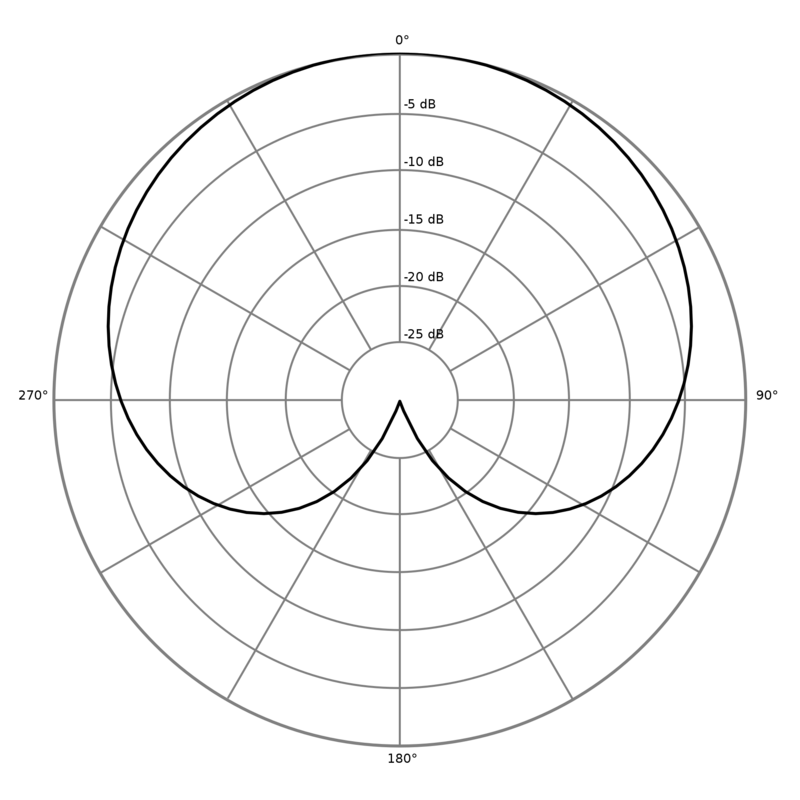 Hence, the user has to speak towards the direction of the Mic which is usually top or the area near to it. The Polar pattern of the Am310 is Cardioid, this technical jargon means a sound sensitivity area/angle around the microphone where it picks the sound waves most accurately. The Cardioid pattern makes a heart kind of shape around the mic, as you can see in the below figure. The AM310 has a sampling rate of 48 KHz. As I mentioned it is driver-free mic which means in MacOS or Windows PC you just need to plugin it for recording, even I tried it in Linux (Ubuntu) where it also worked perfectly. 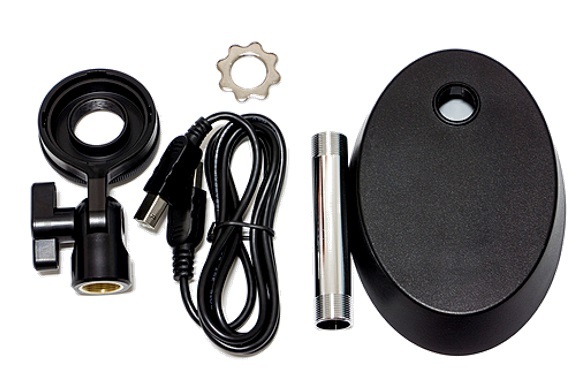 Also, being a plug and play mic the Youtubers can carry it while travelling to record different things, for example in hotel rooms; just connect to the laptop and start recording. The audio recorded by the Am310 microphone is astonishingly rich and clear along with bass capturing capability. But make sure the environment should not be much noisy. In the testing sample 1, we have tested the mic in an empty room where the Desktop system was running along with the wall clock. So, being a condenser microphone, it has high sensitivity as compared to dynamic microphones. That’s why in the first audio sample, you can even hear the ticktock of the clock and Desktop system’s fan sound. Although it is good, it has high sensitivity towards the sounds; this also means that the user should use Am310 in a quiet environment to record an optimal level of audio. But if you talk about the vocal or the music, I have recorded, the fourth sample along with guitar; both the vocals and instruments sound were sharp, clear and rich. Each word can be heard clearly. 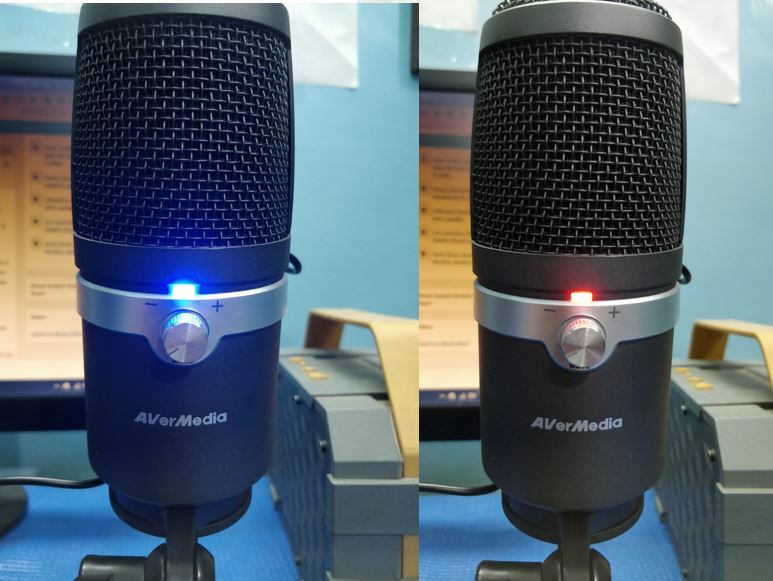 The AVerMedia AM310 USB Microphone at an online price of around ₹₹9,990 (Flipkart) definitely a solid choice for budget conscious video content creators and live streamers. As per our test, not only gamers or streamers but even the musicians can use this mic as well. 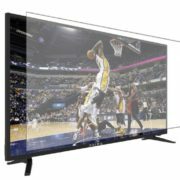 The best part is the real-time monitor feature via 3.5 mm output that also allows hearing the audio output from PC. Furthermore, low power, plug & play, dedicated control knob for headphone volume makes it a value for money as well as an optimal choice over mics like Blue yeti coming in the same budget range.